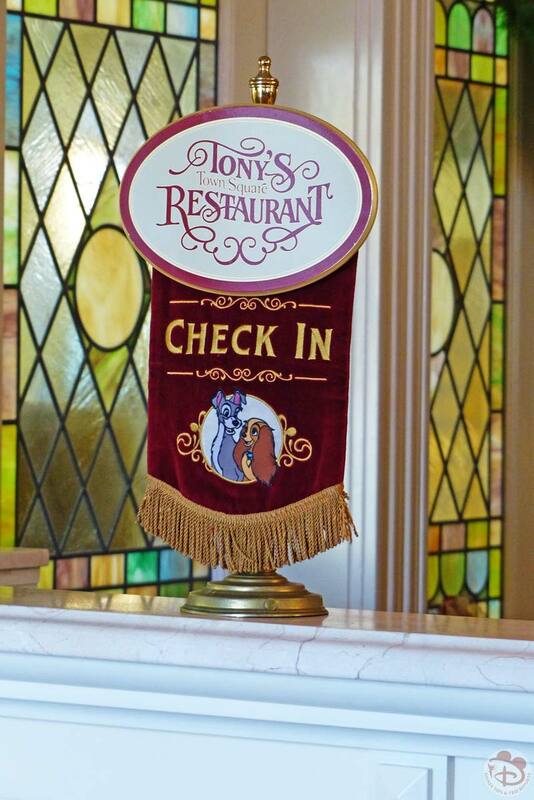 We had an early lunch reservation booked at Tony’s Town Square Restaurant. I don’t think we’ve ever noticed this place on any of our previous trips, and we really enjoyed our meal here. The theme here is from the movie, Lady and The Tramp, and the food is Italian-American. There are three seating areas – one inside with booths and dark wood fixtures and fittings – plus lots of artwork on the walls; one inside a conservatory which is bright and airy; and finally there is room outside on the terrace as well. We sat in the conservatory area by a window, where you get a good view of the town square. 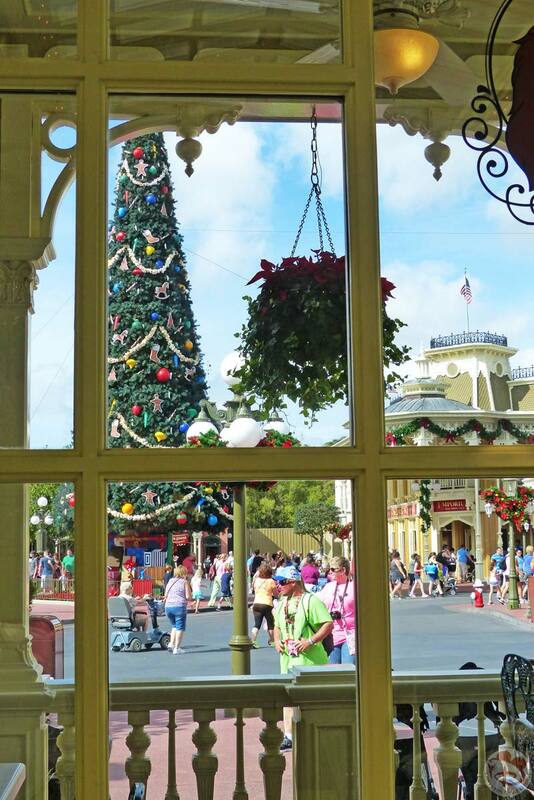 If you get your timings right, and can sit outside on the terrace, this is a good spot for parade watching too. From experience, we always get a bread service at a Signature Restaurant, but I don’t think we’ve ever had bread at a regular Disney restaurant. 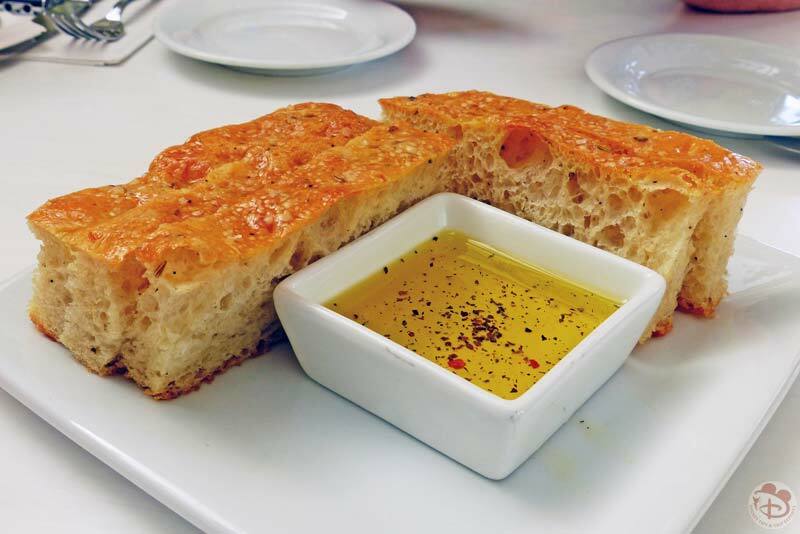 Until now – we were given some slices of focaccia with a herb oil to dunk into. A nice freebie if you’re feeling a bit peckish! 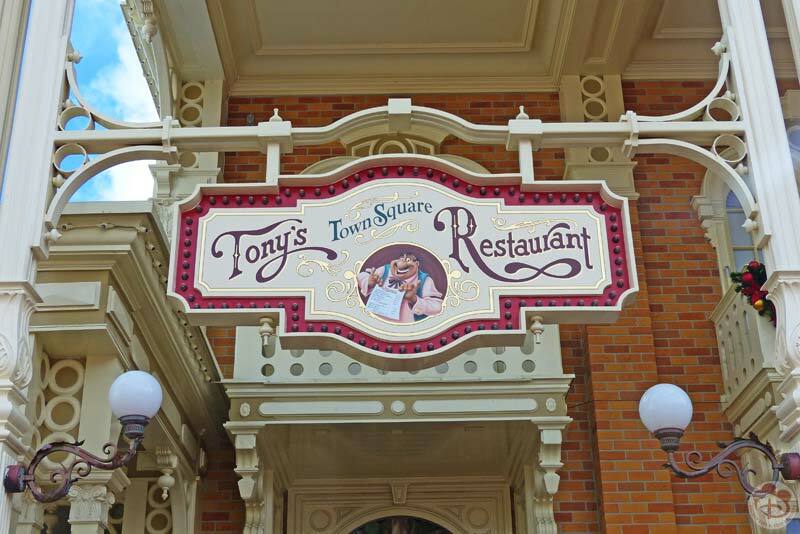 Tony’s Town Square Restaurant is somewhere that we would visit again (in fact, we have on our 2016 trip!). Service was good, and the food was tasty and nicely presented. It feels like a no fuss, no frills restaurant with a homely feel to it. I liked that there were different areas to sit, I’m sure you could probably request when you check-in for your reservation, but might have to wait if it is busy. I also loved the Lady and The Tramp themeing – it’s such a classic Disney film! My started was delicious. 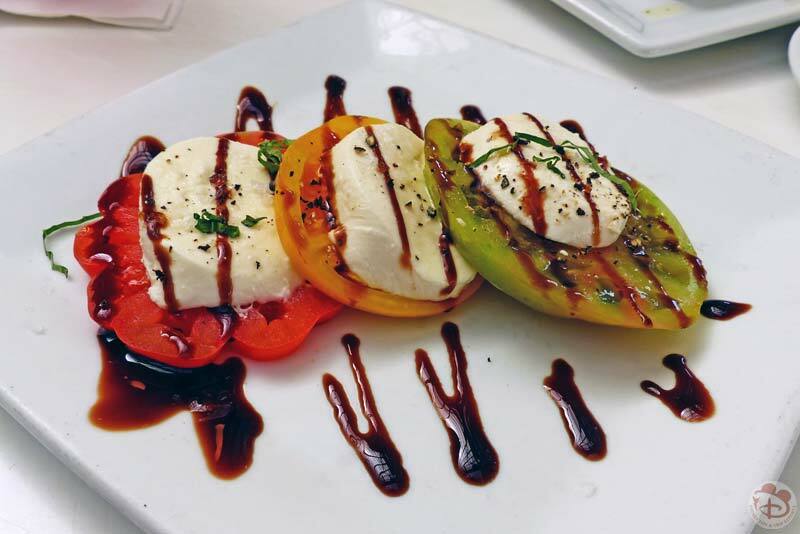 I really liked that there were three different coloured tomatoes on the plate. I was surprised with Liam’s choice for starter – the only soup I have known him to eat is my chicken soup! But he told me he had, had this dish at an Italian restaurant with his dad and enjoyed it. 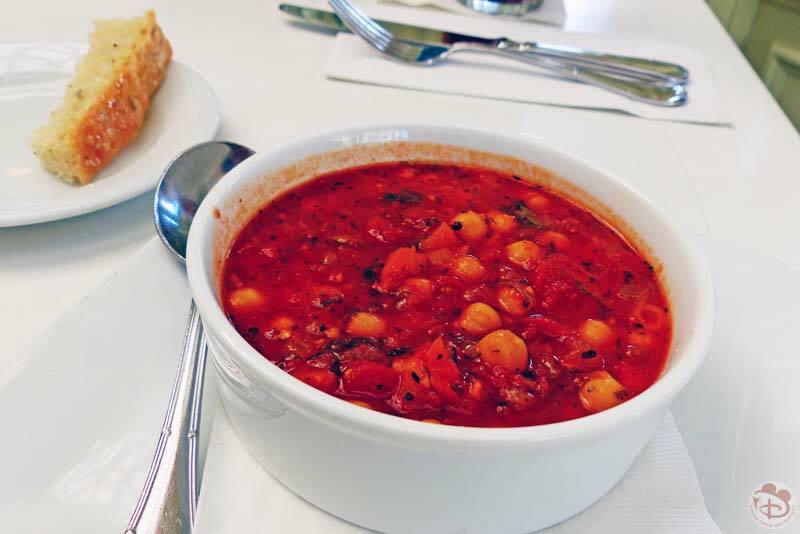 It was a hearty soup, and full of flavour. Steve’s app was tasty. 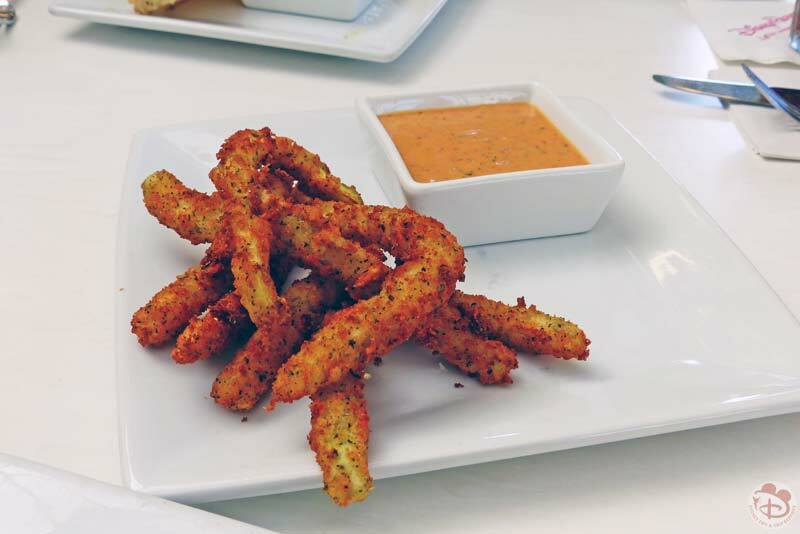 The dipping sauce was nice for dunking the crunchy zucchini fries. Once we received our dishes, our server offered grated cheese if we’d like, and with a deft hand, was using the grating contraption to shred some over the top of mine and Liam’s pasta. 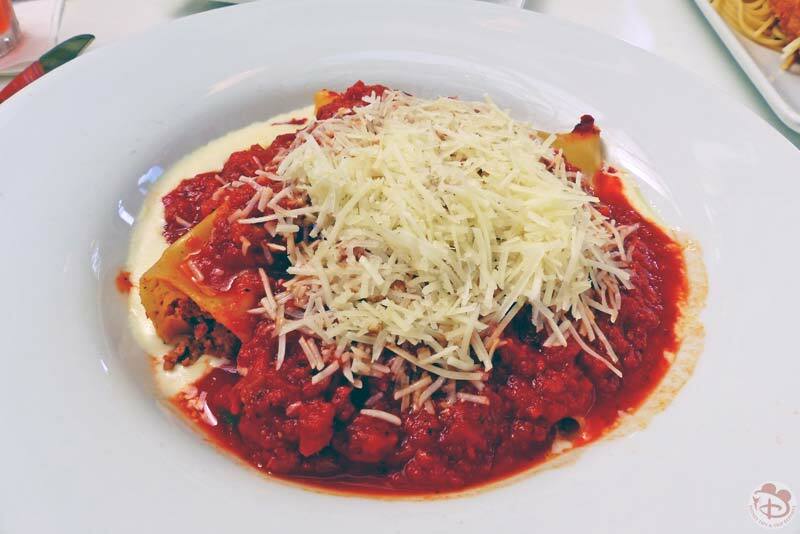 I really enjoyed the cannelloni – it was very filling. 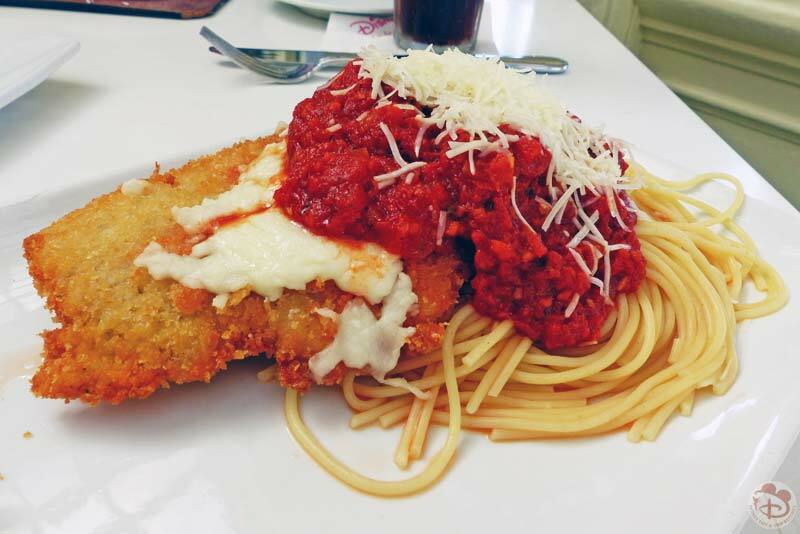 Both Steve and Liam enjoyed their main dishes – the chicken parm was a huge portion! 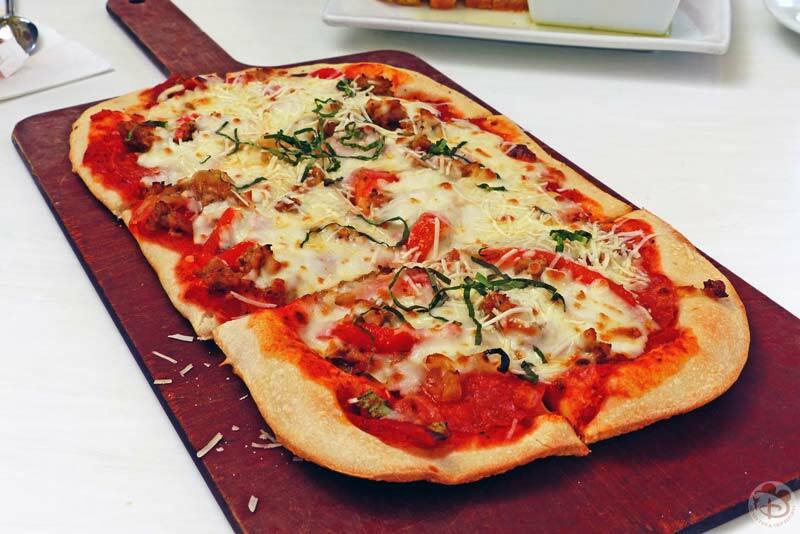 The pizza was presented on a wooden board, which we thought was a nice touch. 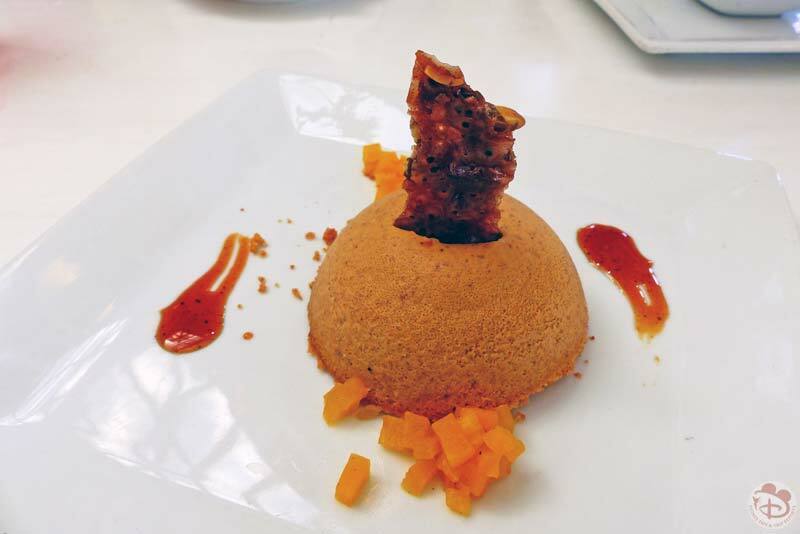 Unfortunately, I don’t remember exactly what I had for dessert as it was a seasonal chef’s special. I am pretty sure it had something to do with pumpkins though, given the time of year that we were there! 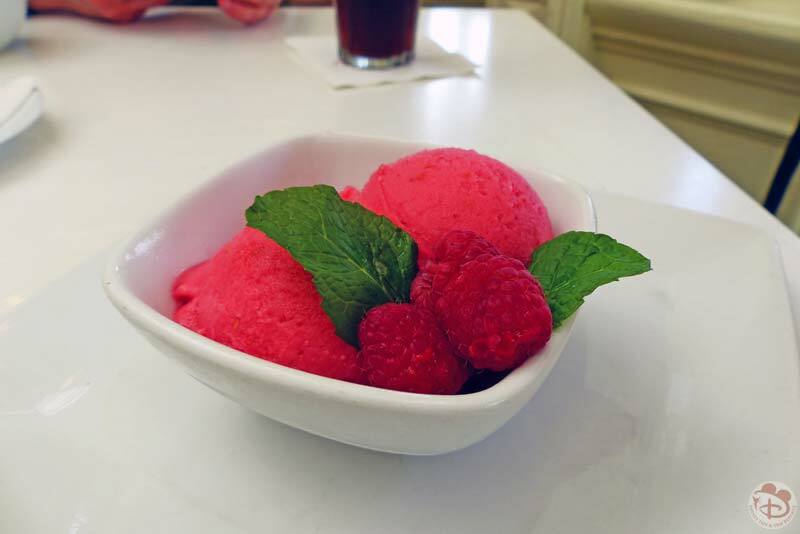 Steve opted for the lighter dessert with sorbet – I’m guessing it was raspberry flavour. 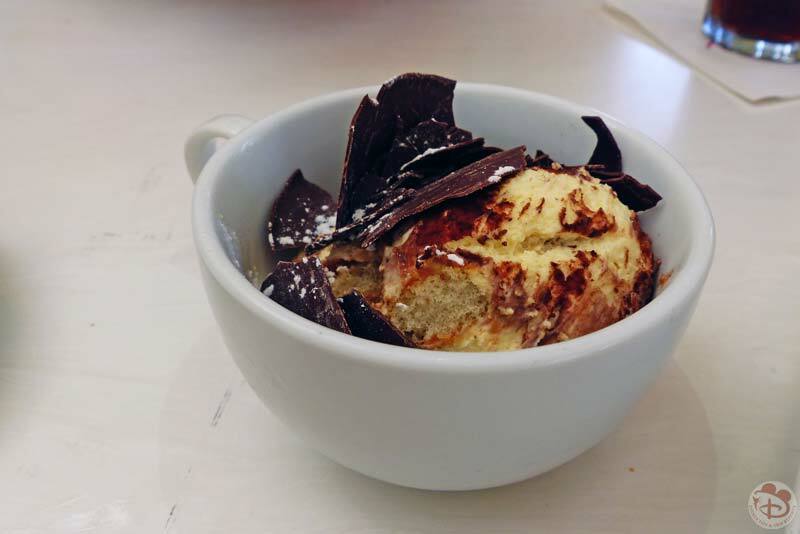 Liam didn’t fancy a dessert, but we ordered a tiramisu, which came presented, rather cutely I think, in a coffee cup.